As a life long caramel lover, I realize the gravity of the statement above. One taste of this healthy caramel dip, and you will know that it isn’t an overstatement. Not only is it the best healthy, vegan, dairy-free, refined-sugar free caramel dip I’ve ever tasted, it is the best caramel dip I’ve tried, ever! It’s thick, rich, buttery, smooth, and sweet, with a hint of salt. It melts in your mouth, and pairs beautifully with freshly sliced apples or even pears. Are we drooling yet?! Growing up, I used to love eating caramel apples. They were always a special treat right around Halloween. I can remember going over to my grandma and grandpa’s house, and in addition to candy bars, there would be a tray of homemade caramel apples. Yum! Years later, it became even easier to get that caramel and apple fix, with the invention of those tubs of caramel dip that you can find in the produce section. I remember my mom and I going a little crazy over those when I was in high school. So good, and so easy! A lot less messy than a gooey caramel covered apple on a stick, too. Last fall, my husband and I were buying groceries and he wandered over and picked up a container of T. Marzetti Old-Fashioned Caramel Dip. Since I had just decided to consume less packaged foods, and was really getting into a groove making things from scratch, I said “I’m working on a caramel dip, using dates. It’ll be a lot better than that stuff.” He just gave me a look, and obviously wasn’t convinced. He reluctantly put it back. That same weekend, I got to work in the kitchen. I used several ideas from cookbooks and blogs, tweaking amounts and ingredients and adding my spin on it, until I got just the right texture and flavor. I was excited! I dipped in a slice of apple and held it out to my husband. “Taste it.” He took a bite… his eyebrows raised and he kept chewing. “That’s pretty good!” Knowing how skeptical my husband is of “healthy” treats, I was thrilled by his response. We agreed it tasted a lot like the T. Marzetti dip, but better! What I like best about this dip is that all the ingredients are actual foods, with things like fiber, protein, vitamins, and minerals. Take a look at the back of the T. Marzetti Caramel Dip, and you’ll see that the nutrition label doesn’t list much nutrition. The ingredients in the Old Fashioned Caramel Dip are: High Fructose Corn Syrup, Skim Milk, Corn Syrup, Palm Oil, Sugar, Butter (Cream, Milk, Salt), Modified Corn Starch, Disodium Phosphate, Potassium Sorbitate (Preservative), TBHQ (Added to maintain freshness), Salt, Mono and Diglycerides, Artificial flavors. The ingredients in my caramel dip? Dates, almond butter, coconut oil, vanilla, and salt. At first glance, both dips have a similar amount of calories and fat, and my healthy dip does have natural sugars. However, the healthy dip also has fiber and protein, and healthy fats. Not to mention it’s made from whole foods, which our body digests easier than say, High Fructose Corn Syrup. Also, this dip has no cholesterol, and contains no dairy or other animal products, so it’s great for those who follow a vegan diet, or are allergic to dairy. Personally, I think that my Best Caramel Dip just tastes better! You certainly do not have to be vegan or allergic to dairy to enjoy this dip. This is caramel dip for EVERYBODY! Give this caramel dip a try, you’ll be glad you did! Happy Halloween! 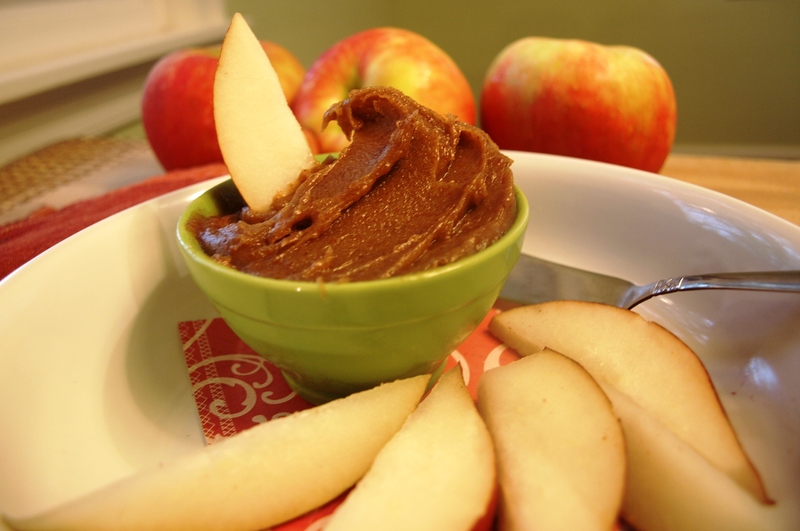 The Best Healthy Caramel Dip – Ever! 2. Place almond butter, melted coconut oil if using, almond milk, salt, and vanilla in your food processor. 3. Drain the dates in a strainer, gently pressing to remove any excess water. 4. Add the soaked dates to your food processor with the rest of the ingredients. Process until completely smooth, stopping the machine to scrape down the sides as necessary. This took about 2 minutes in my food processor. 5. Serve with freshly sliced apples or even pears (those are actually pear slices in the photos :)) Store leftover dip in the fridge (if you have any!) where it should last at least a week. Using soft dates is important! I highly recommend Natural Delights Organic Dates, which I buy right at our grocery store, next to the raisins. If your dates are on the harder side, or you have a sluggish food processor, you can try soaking them for an extra 10-15 minutes in the hot water. 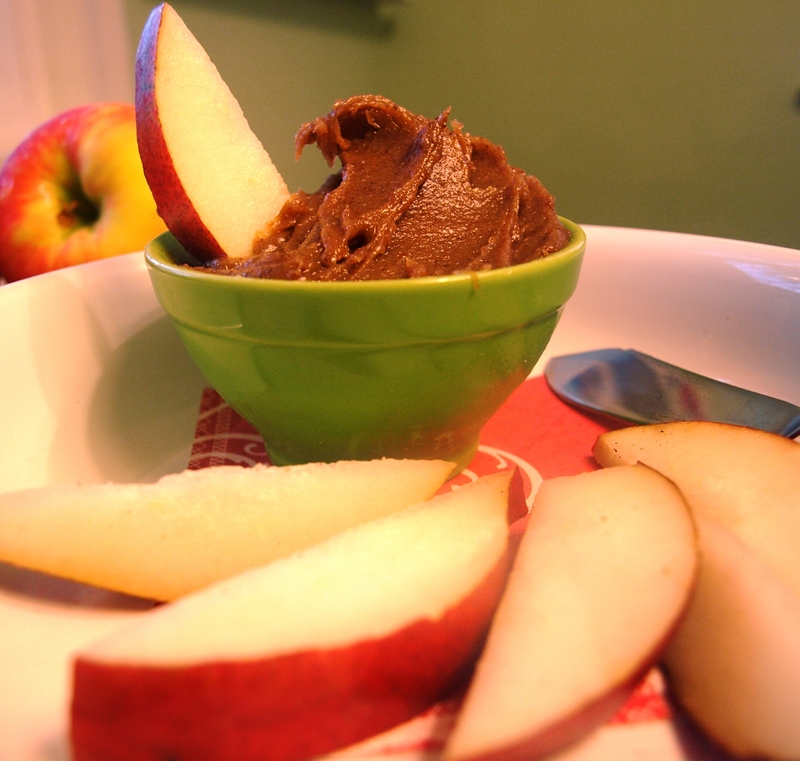 Another trick to get the dip extra smooth is to use room temperature almond butter. You want it to be drippy, not firm. If your almond butter isn’t drippy, you can try heating it in a saucepan with your coconut oil over low heat, stirring and melting them together before adding to your food processor. Um, YUM! I have some homemade almond butter to use up (ingredients: almonds – love it) that would be perfect for this. Absolutely! I think it would be a fabulous way to use up your almond butter 😊. Hope you enjoy and have a happy Halloween! You can sub in any nut or seed butter, it’s there to add a little creaminess. You could also try using coconut cream. Let me know how it goes if you give it a try! Just made this and it is sooooooooooooo good! I could sit and eat the entire batch! Thanks for the recipe!